Let’s check our collection of best truth or dare questions for girlfriend. You can try these questions when you are playing truth or dare game with your friends or with your partner. Enjoy our truth or dare questions for girlfriend and have fun. Has anyone ever walked in when you are in the washroom? Are you honest with your partner about what you need in a relationship? How important is marriage to you? Is there anything you want to change about yourself? What is your favorite thing to wear to bed? What is that one place in the world you would like to visit at least once in your life and why? If you had to talk with a girl other than from your family, who would it be? What are the qualities you like in me the most? What was the first thing that you noticed about me that made you feel attracted? What is the happiest memory in your life? What is your first impression on me when you first met me? What is that video or gif that makes you laugh? What song do you play most often? Hope you like our list of best truth questions for girlfriend. If you know any other truth questions for girlfriend, let us know in the comment section below. Waste your day without doing anything (simply sit in your room). Make a huge noise in a silent situation. Move on with me whatever place I decided to go. What are your social networking site passwords? Borrow some money from your best friend and never return the money. Ask me to pull your hair while we are fighting. Act like your favorite child TV actor. What is your biggest childhood memory? Make a video call to me and speak for 1 hour? Buy a toy and play with it like a kid. How often do you become anget when I send frequent messages to you. Make a voice call to me and sing 2 songs. Spend your spare time only with me for one week. Take a funny selfie and send it to me. Hope you like our list of best truth or dare questions for girlfriend. 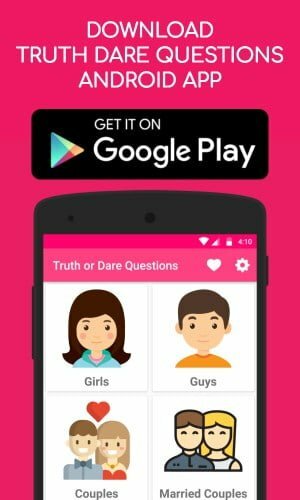 If you know any other truth or dare questions for girlfriend, let us know in the comment section below.